Health Canada has issued a recall on sets on small magnets. This item is affected by the recall and is no longer available for sale in Canada. This item can only be shipped outside of Canada. For more information about the recall, follow this link. This special edition cube comes in a sturdy metal gift box featuring a display window. The box feels heavy and solid, as soon as you hold it you feel that you are holding a quality product. What you get is the same quality Neodymium spheres that we sell in our other listings but in this gift box they are arranged in a rectangle. You still get 216 triple coated N38 neodymium spheres and of course you can make a cube with them. This item was custom made for us, you won’t find better quality anywhere else. These truly make amazing gifts for people you like or for yourself. Get your hands on the latest and greatest puzzle! Made of 216 high strength, high quality Neodymium magnetic spheres this Neocube will keep you entertained for hours. It’s a puzzle, it’s a stress reliever, it’s a desk toy, it’s a construction game, it’s a brain teaser, but most of all, it’s fun! Let the magnetic properties of the spheres guide you and build an almost limitless amount of shapes. No matter what you do, the basic principles of magnetism and mathematics will let you build geometric and complex patterns. Playing with this space age gadget is a truly unique experience, you have to try it to believe it! Coating: High quality triple coating (NiCuNi: nickel, copper, nickel) offers the best protection available against chipping and corrosion. Magnetic strength: N38, Stronger than industry standards. 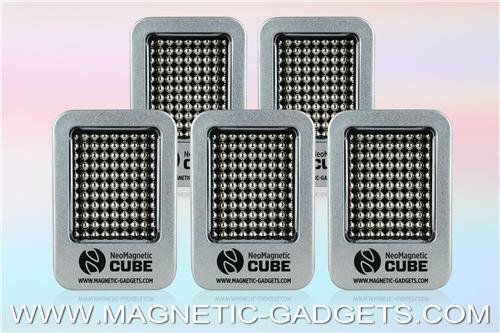 These are the some of highest quality neodymium cubes on the market, their quality surpasses even the more expensive brand name cubes. Trust us, we tried most of them! The coating on low grade cubes will chip quickly, exposing the neodymium core which will soil your hands. Our cubes were custom made to meet the highest quality standards. The coating on these cubes will last for a very long time. It won’t leave you with dirty hands and the feeling that you’ve wasted money on a low grade item. Simply put: our cubes will last longer and perform better than most cubes on the market. Warning: This product is not a toy and is not intended for children. This product contains small magnets that can be harmful or fatal if swallowed. Before placing your order, please review the Warnings page.